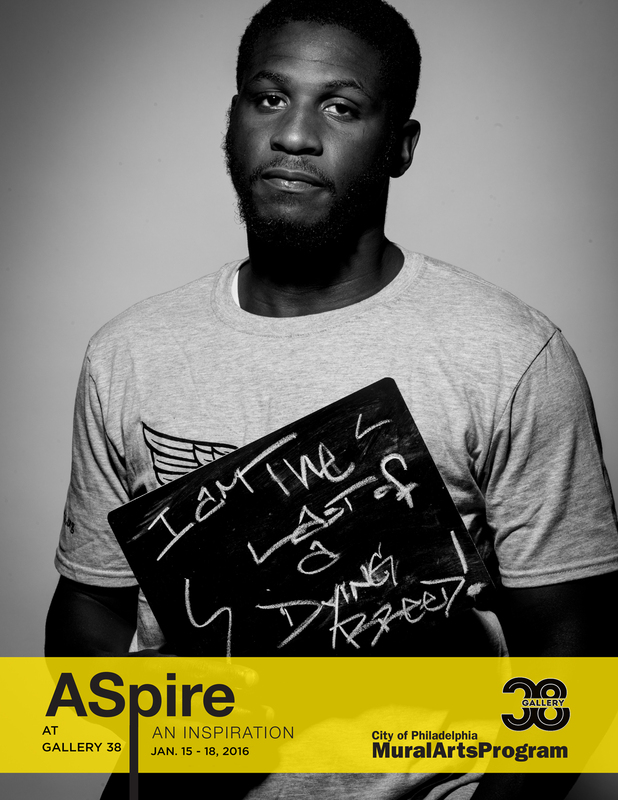 We are honored to bring Aspire: The Philly Project to Gallery 38. The exhibit will be up from January 15th through the 18th with a reception on January 16th from 5pm – 9pm. The lead artist Ernel Martinez was born in the small country of Belize. He was raised in south central Los Angeles and Detroit. His introduction to art was through the underground world of graffiti. He studied art at the Pratt Institute and obtained his BFA from Kutztown University. In 2004, he received his MFA from the University of Pennsylvania. Based out of the Philadelphia area, he explores creative methods to give underserved communities the tools to tell their stories through art- making. He uses their stories as a framework to produce artwork based in social practice that engages and build dialogue. He believes that art enriches communities and is the path to “true” collaboration. Martinez was aided by assistants from the Mural Arts Restorative Justice Program, which provides art instruction, mural making, community service work and a paid work program, the Guild, within the criminal justice system. Inmates, returning citizens and juveniles are afforded the opportunity to learn new skills and make a positive contribution to their communities to repair prior harm caused, reclaim public spaces, develop competency skills and engage victims of crime in dialog. (Quest Love) and Scott Storch of “The Roots”, who produced three songs for their initial demo. Other notable collaborations include working with Larry Gold, Kenny Whitehead, DJ Woody Wood and DJ Tat Money to name a few. In 1994, Shawn earned his first major recording contract with Warner Brothers Reprise Records as a member of the group “Divine Beings”. On his first release on the label, Shawn collaborated with Kwame` to produce the first single titled “Funky Ultimatum”. During that same year, Shawn was invited to perform alongside Jazz Great Steve Coleman and subsequently spent two-months touring Europe as a vocalist (MC) within the group, Steve Coleman and Metrics. By early 1996 Divine Beings had disbanded and Shawn began to focus more on the production side of music. It was in the summer of 1996 that Shawn began working with Dwight Grant, professionally known as Beanie Sigel (however – then known as Beanie Mack). It was Shawn’s guidance and nine-song demo tape he produced that assisted in Beanie Sigel’s signing to Roc A Fella records. After a lengthy hiatus from the music industry, Shawn partnered with long-time friend & musician, JaRon Burnett, to form the production juggernaut known as the PHREMAN Music Group, rooted in Hip Hop with influences in Soul, Rock, Jazz and World Music. Now solely spearheaded by JaRon, PHREMAN Music Group continues its commitment to producing numerous projects including film scores, community education projects, and collaborations with industry recording artists, internationally. with HIV & STD awareness, and conflict resolution interventions. In 2012, Shawn was awarded a Black Male Engagement (BMe) Grant through the Knight Foundation for the development of the PHREMEN Audio Studio Academy. The BMe grant helped the duo fulfill their desire to give back to the community by marrying their gifts of music with helping urban youth. The PHREMEN Music Group is now solely spearheaded by JaRon Burnett, and the music program continues to flourish with new student enrollments in each program cycle. Dr. Shawn L. White, MHS, PhD – aka- Air Smooth earned a Master of Human Services from Lincoln University in 2004, and in 2011 he earned his PhD in Human Services from Capella University. Shawn began his professional career in social service at the Youth Outreach Community Awareness Program (YOACAP), where he worked for more than 16 years, as a cast member and peer educator for an HIV/AIDS awareness stage plays. At YOACAP, he was instrumental in the writing, development, casting, and training of four youth awareness psychodrama presentations geared towards helping youth and young adults make positive life choices. Terrell witnessed a significant need in the Philadelphia community for a program like Voices of the Village, and the two men banded together to form this wonderful organization. 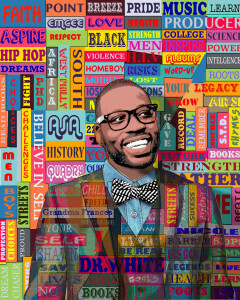 Most recently he was employed as program director at the University of Pennsylvania’s School of Nursing, conducting an insightful research study entitled “Barbers Building Better Brothers” – An African American Male Health Promotion Project. Prior to this, he worked at Drexel University as a researcher for the “Represent” study, which explored the gender role norms and sexual scripts of heterosexual African American men in Philadelphia and their risk for HIV infection. and recording artist with a wide array of musical & instrumental talent. In 1993, Shawn was a regular in the studio working alongside names like Amir Thompson. ASSISTED BY Stephanie Acevedo l LaTasha Billington l Glo- ria Martin l Antoineka Sanders l Elise Stewart l Melissa Lyn Yeager l Members of Mural Arts Restorative Justice Program – The Guild, and youth from the mentorship program. Universal Companies, the RFP Mentoring Program, City of Philadelphia Councilman Kenyatta Johnson, Epic South, Universal Audenreid High School, KBI Solutions NonProfit Consultants, and the Youth Violence Reduction Partnership (YVRP). GENEROUS SPONSORS Emmanuel Sofolawe, graphic design l JINJA l Brown Betty Dessert Boutique l Lusters Hair Products l Duafe Hair Products l Hello l Mi- chael Scipione l Jason Lloyd Funeral Home, Inc. Funded by The City of Philadelphia, The De- partment of Human Services, PhillyRising, The Roots, Hummingbird Foundation, Lenfest Foun- dation, JP Morgan Chase, Bryan Weingarten, I.B.E.W. Local 98, Philadelphia Activities Fund, the City of Philadelphia Prison System.